CONDOR was set up in 1930, in an area at the outskirts of Bucharest, on an aviation field. The company was destined just for aerostat construction and parachute repairs. Romania's involvement in World War II, entailed the extension of the factory activities, CONDOR ensuring the necessary equipment for the Romanian aviation by manufacturing parachutes under "IRVIN" licence, a company from Great Britain. In 1948, the company was nationalised. A modern, new headoffice was built and the latest equipment at competitive standards was acquired. 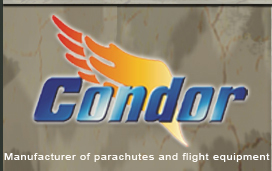 The present company, CONDOR S.A., has its head-office in Bucharest and was built in 1990, by taking over the patrimony of the Parachute and Flight Equipment Company - Bucharest. Ever since that very year, CONDOR has developed a marketing strategy to ensure a more active presence both on the domestic market, and on the international one. Likewise, through its restructuring policy, the company has developed production and own research, by engaging the energy and enthusiasm of a professional team formed of specialists in aviation and textiles, and the experience of a qualified personnel. The production spaces were reorganised, the main units were reequipped and performance machines were acquired. Closer to the sky!